In 'Here we are' 2016, New Zealand artist Kushana Bush traverses, in painstaking strokes of gouache, a vast array of sources -- from Mughal miniatures to medieval books of hours and Italian Renaissance painting -- to create one of her most ambitious works to date. 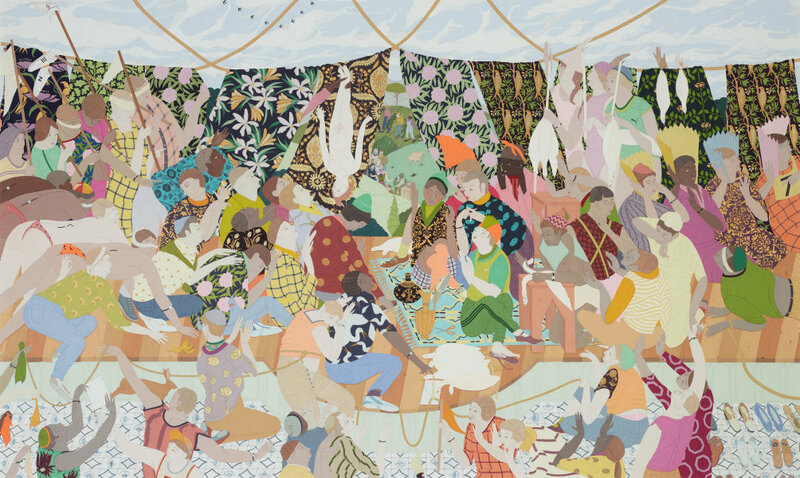 In a brocade of figures, colour, gesture and pattern, Bush seamlessly infuses historical references with symbols of our contemporary world, blurring temporal, cultural and geographical boundaries so that, contrary to the assertion of the title, exactly where we are is anything but clear-cut. To look beyond the intensity of her detailed imagery, and at the scene at play, we can establish that an exchange is taking place between two parties. Hand gestures and facial expressions ricochet from one party to the other, and among their crowded bodies, lie an assortment of offerings – a pair of scissors, a golden ewer, a banana peel, a wristwatch. This scene of marketplace trading — or perhaps, dispute resolution — teems with mixed messages. Yet, its formal values create a distinct sense of coherence; it is at once confused and balanced. Bush’s ability to bring together difference and likeness in such an original and complex manner is what makes her narrative form of inquiry so intriguing; her storied depictions of collision and coexistence tap into something fundamental about the fabric of societies; the way we commune and communicate; the way we construct meaning and create purpose; the way we exchange and evolve. Based in Dunedin, where she grew up amongst her parents’ collections of Indian miniatures and Japanese woodblock prints, Bush paints amongst a library’s worth of books and archival material, and the sound of the news on her radio. And indeed, in her work there is the sense of looking out at the world, as a quiet observer, from a distance. Kushana Bush, Kushana Bush: The burning hours , 'The works', pg. 61-118, Dunedin, 2016, front cover (colour illus., detail), 98-99 (colour illus.). Lisa Catt, Look , 'Follow the crowd', Sydney, May 2017-Jun 2017, 26-7 (colour illus. ).